eat good food – ahoyfriend. no grains again this week. tonight I got home a bit late and was starrrrving. my recipe was up, so that meant cooking duties for this girl. and my pick of chickpea schwarma. I thought this was going to be an ordeal, but it was pretty smooth sailing. I was guided by this post on What’s Annie Making? her recipe is for the chickpeas and taziki sauce. and she had hers with pita. no grains is no pita for us. and she talks about “sauce” but there was no sauce. 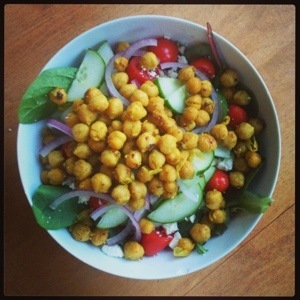 we had the chickpeas on mixed greens with cherry tomatoes, red onion, cucumber and feta cheese. we also used our own taziki sauce, but her recipe looks good too. mmmmm. make extra for lunch the next day! so easy! looking forward to spending more time checking out What’s Annie Making? that looks mighty delicious and now I have a new blog to follow 😉 thanks friend!